In 2017, Blue Mountain Health System (now part of St. Luke’s) was awarded $1,000 toward their “Healthy Smiles Happy Kids” Dental Van. 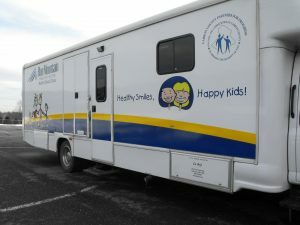 The dental van was a project that grew out of the Carbon County Partners for Progress, a collaborative effort to understand community needs and find appropriate solutions. The 2017-18 year was the van’s eleventh year of service to Carbon and Schuylkill counties. The program provides check ups, x-rays, cleanings, and various other dental work to children ages 3-18 and is the primary dental care for over 900 Medicaid and CHIP eligible children. Even with insurance, many adults and children in our community struggle to access care since very few dentists accept Medicaid and other publicly-subsidized insurances in our region. The dental van helps Carbon-area families by bringing basic dental services to schools where children in need can easily access care. Each child leaves their van visit with a toothbrush, toothpaste, and floss, and is taught about good oral hygiene. Over 2,000 patient visits take place on the van each year.